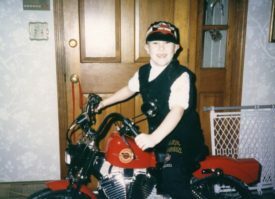 Mike Cochran of Oak Brook had grown up always wanting to get a Harley-Davidson motorcycle but never doing so because of an agreement he had with his parents. 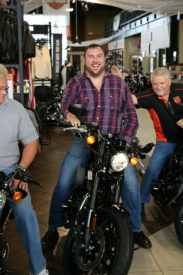 “We have a family business and the rule is if I ever wanted to work here, I couldn’t get a motorcycle,” Cochran said. He is Director of Finance for Stoelting Co. of Wood Dale which manufactures instruments and assessments for basic scientific research and practice, including lie detectors and polygraph training and developmental disabilities testing. Pretty good, it turns out. Cochran was one of six finalists drawn for this year’s raffle. 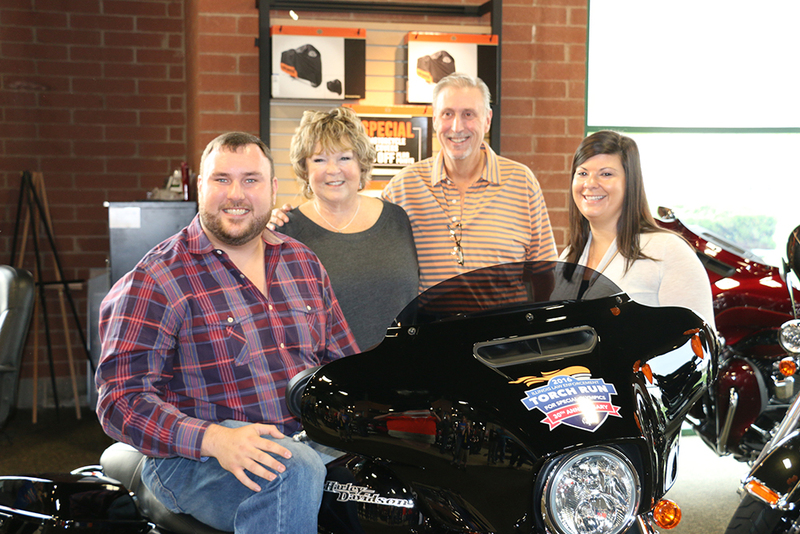 He was invited to a finalist party at Chi-Town Harley-Davidson in Tinley Park to determine the winner of the 2016 HD Street Glide. Each finalist randomly drew a key to one of six bikes and the one that started their bike would win the Harley. Other finalists receive a big screen HDTV. Once they got over the initial shock at his winning, Cochran says his parents were happy, but told him to “be careful.” Admittedly “not much of a risk-taker,” he purchased the appropriate Harley accessories to keep himself safe on the road – helmet, leathers and boots – before leaving the dealership. He’ll be taking a motorcycle safety course at Chi-Town Harley in April. Cochran bought his tickets at a Law Enforcement Torch Run golf outing at Oak Brook Golf Club; a friend of his father had invited him to the event. His parents are graduates of the Oak Brook Police Department’s Citizens Police Academy. After hearing that the Harley-Davidson Raffle was a little short of making its goal of raising $100,000 for the year, Cochran wrote a check to push the fundraiser over the goal. “I figured it would help them next year in promoting that the 2016 raffle raised more than $100,000,” he said. “I always knew the only way I’d ever get a motorcycle was if I won one,” Cochran said, adding the first time he even turned the ignition on a motorcycle was at the finalist party. “I’ve always wanted a Harley. It’s more of my style and you can’t beat the sound they make.” He has a picture of himself as a young boy riding a Harley-Davidson bicycle he got for Christmas one year. Until Oct. 29, that was the closest he had gotten to having his own Harley. Now, he’s won his own motorcycle and kept his promise to his parents. Learn more about the Illinois Law Enforcement Torch Run and how it supports Special Olympics Illinois athletes through various fundraisers like the Harley-Davidson Raffle on its website.